Kangaroos are a much-loved international icon, recognized around the world as part of Australia’s unique identity. We are deeply concerned that the killing of kangaroos has become the largest wildlife slaughter on the planet. After spending 5 years making our award winning film “KANGAROO a Love Hate Story” we have been shocked to learn about the brutal treatment of kangaroos across Australia. Many proud Australians, scientists, politicians and indigenous representatives have come forward presenting us with eyewitness testimony and evidence proving systematic cruelty against our national icon. A group of international academics have written a letter raising concerns about the ongoing exploitation, abuse and lack of population transparency surrounding the treatment of this unique species. 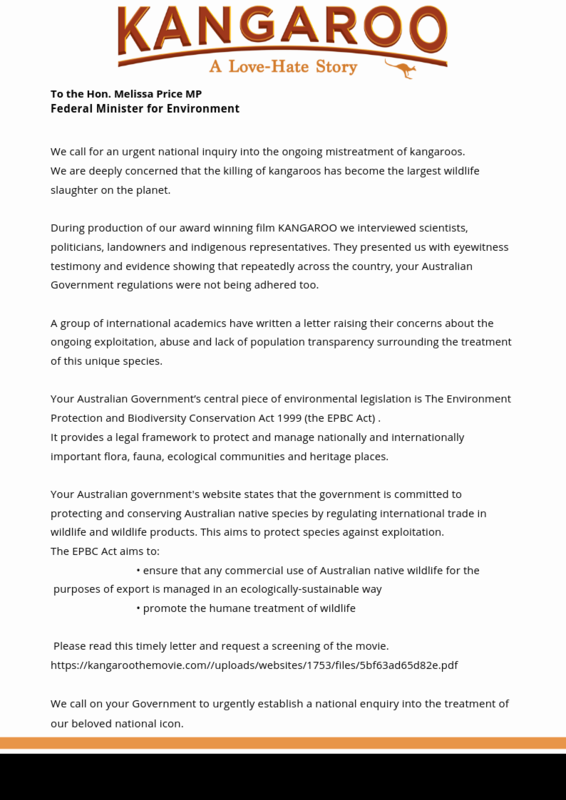 Please read their letter and SPEAK UP for kangaroos NOW. The recent release of the movie Kangaroo: A Love-Hate Story, has sparked controversy and discussion about the shooting of kangaroos, their place on the land, and our relationship with them. Over the last 25 years, new research on kangaroos has been conducted to examine these questions. Representing a collective of scientists, economists, and lawyers, who have studied kangaroos and related issues, we wish to highlight some key issues that will help clarify the controversy. The question of whether we should, or should not, subject kangaroos to mass killing is not limited to a scientific disagreement over facts relating to the numbers of kangaroos, the humaneness of their death, or the contamination of their meat, although there is considerable debate about these. Rather, the story uncovered by this new documentary requires us to ask why a commercial industry based on vilification of kangaroos as “pests” has been allowed to occur at all. Contrary to what many think, kangaroos are not farmed – they are bush meat and leather. It is a blight on our nation and is of no virtue – economically, environmentally, or ethically. The media attention and debate resulting from the release of the film highlights just how little Australian’s know about their fellow wild inhabitants. The diverse group of macropod species, collectively known as the kangaroos, are no longer widespread and thriving. Since European settlement of Australia, some have gone extinct, some are seriously threatened, and others have suffered considerable local population collapses. They have less and less land to be free from human encroachment. They are suffering fatal disease outbreaks and we don’t yet know what effect climate change will have on them. On top of that, since 2000, an average of over two million kangaroos per year have been shot by commercial shooters for the meat industry, an undocumented but considerable number are shot by farmers who see them as pests, and they are even shot by some wildlife managers who similarly want them removed or reduced in number. Individuals, family groups, and populations are affected by this. For example, living in strong family groups (or mobs), large grey males are often easy to kill first because they stay to defend their mob against attack. Matrilineal lines and bonds are broken when large females are killed. Young at foot joeys are left without maternal care. The commercial kangaroo industry has fulfilled the desire of the farming lobby, providing a government-backed solution to their “problem”. Across parts of five states (QLD, NSW, SA, WA, and TAS) it kills four species of large kangaroo and two wallabies from two genera (Osphranter and Macropus), each with very different behaviour, physiology, reproduction, and ecology. The government regulates the industry by providing a shooting quota and a pathway to domestic and export markets. This regulatory framework, however, is not working. The National Code of Practice for the Humane Shooting ofKangaroos and Wallabies for Commercial Purposes sanction cruelty, is virtually impossible to enforce and provides the industry cover for serious breaches of animal welfare standards. Most shooting occurs at night with small moving targets (the head of a kangaroo). Some evidence suggests that up to 40% of kangaroos may be shot in the neck or body resulting in wounding and non-instantaneous death. Incredibly, the death of hundreds of thousands of dependent young annually is considered “collateral damage”, with research confirming that most dependent young are left to suffer exposure, starvation, and predation when not processed according to the code. Claims of exploding populations and over-abundance are not scientifically valid. Kangaroos are slow breeding wildlife, able to produce on average one offspring per year when at reproductive age (typically three or four years of age for the larger kangaroo species). These offspring rarely survive. In one of the best studies of this to date, female red kangaroos from a protected (un-shot) population were able to successfully raise just over three young to independence in their lifetime on average (an average of 33% success). How many of these went on to be successful mothers is unknown. For its part, the government estimates the numbers of large kangaroo species using helicopters and aeroplanes. This costly exercise is fraught with difficulties – how to take a representative sample of the area being surveyed, how to account for unobserved individuals, how to account for absent individuals, and how to extrapolate findings to areas not surveyed. These questions are faced by all exploitation industries when trying to achieve sustainable quotas, often with varied success (e.g. the fishing industry). The lack of transparency around how kangaroo populations are estimated and their quotas set is of particular concern.Aerial counts of kangaroos, funded by tax payers, remain inaccessible to the public, yet similar aerial counts of waterbirds used to set duck hunting quotas, perhaps similarly controversial, are made available in the Atlas of LivingAustralia. This does not encourage confidence. Although the government and industry advocate for the robustness of their kangaroo population estimates, there are valid reasons why the public should be concerned about the large errors in estimates, the lack of adequate coverage and representation in some jurisdictions, and the reliance on frequently amended “correction” factors, which to the best of our knowledge are not accounted for in the long-term population trends since the year 2000. Far from being out of control, kangaroos do not prosper from land clearance or the installation of watering points. Research indicates that competition with livestock is minimal and primarily restricted to drought periods. Their abundance is adequately regulated by natural processes such as quality of nutrition, disease, and predation (e.g.dingoes and foxes). Loss of habitat to urban and small-scale rural development, land clearing, fencing, and agricultural practices isolate kangaroo species across regions where historical records describe them as once widespread and abundant. Even when wild kangaroos venture onto crops or grazing land, is killing them the only answer? There are other ways that any losses can be mitigated and benefits to land management, like nutrient recycling, accrued. The industry also risks serious human health ramifications. Most infectious pathogens to humans can be transmitted from wildlife. Kangaroo meat is a concern because kangaroos are shot and eviscerated in remote locations in the outback, frequently by minimally trained shooters who also act as butchers. Gutted carcasses are transported in open non-refrigerated trucks, exposed to flies, dust, and summer heat, for up to ten hours before being deposited in cold storage. Retail kangaroo meat from different supermarkets in cities across Australia, and direct from processing plants, has been found to be contaminated with unacceptable levels of Salmonella and E. coli over multiple years of testing. Russia banned kangaroo meat imports three times due to pathogenic contamination, and more recently, acetic acid has been routinely applied, without disclosure to consumers, to rid the meat of systemic contamination. If you are going to eat kangaroo meat, make sure it is well-done. How do you then weigh up the social and ethical cost of animal cruelty and environmental harm against the economic benefits? The industry claims avoided costs to farmers and the profits accruing to Australians from the sale of kangaroo products. However, profits accrue to relatively few individuals and the industry’s claim of supporting 4,000 jobs is unsubstantiated and misdirected. Most shooters are part-timers and could be provided with alternative employment in related fields. Thus, relatively few individuals in the Australian economy benefit from an industry propped-up by taxpayers dollars. Valuing kangaroos not for their meat and skins but for their ecotourism potential as the epitome of theAustralian bush would provide far greater and fairer economic return. Rather than lethally exploiting our wildlife to satisfy their unfairly attributed status as “pests”, we believe that Australia should invest in coexisting with our national icon. Dr Dror Ben-Ami, Dr David Croft, Dr Daniel Ramp, Dr Keely Boom, Ms Katrina Sharman, Dr Christine Townend, Ms Louise Boronyak, Dr Neil Perry, Dr David Brooks, Dr Liv Baker, Dr Arian Wallach, Dr Ingrid Witte, Dr Steve Garlick, Dr Rosemary Austen, Mr Ray Mjadwesch, Dr Peter Simmons, Dr Michael Mehmet and Dr Clive Phillips. Open this letter as a pdf.